Because the characters in Pierre Choderlos de Laclos’ novel Les Liaisons Dangereuses (Dangerous Liaisons) are very French and not ‘august’, I’ve chosen to profile two very different film adaptations from this book for this month. The author, Choderlos de Laclos, was a Brigadier General in Napoleon’s army. His novel was condemned as ‘revolting immortality’ when it was first published in Paris in 1782, but that didn’t stop it from being voraciously read over the next two hundred years! 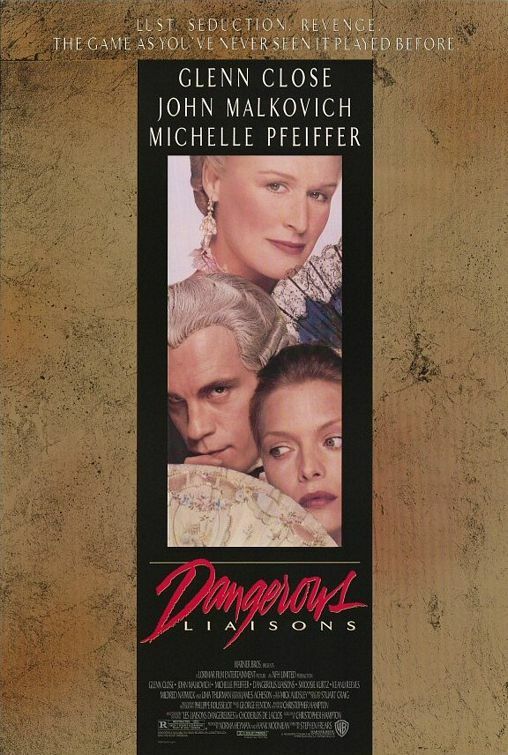 Vicomte de Valmont (John Malkovich) and the Marquise de Merteille (Glenn Close) enjoy a close, although not sexual, relationship based on desire and disdain. They are perpetually trying to outdo each other in their morally reprehensible acts, which generally involve the deflowering of young socialites. When she asks him to seduce Cecile to humiliate her prospective husband (the Marquises’ ex), he initially refuses because he’s trying to bed the highly moralled Mme de Tourvel (Michelle Pfeiffer) just for fun. When Valmont locks horns with Cecile’s protective mother, he decides that bedding her, in defiance of the mother, may be a good idea after all. Meanwhile, the ‘bet’ between the Marquise and Valmont is that he cannot bed Mme de Tourvel, and if he does, he must provide written proof and then he will actually get to sleep with the Marquise. The film could so easily have fallen apart due the sheer ludicrousness of the plot, but the wonderful acting by the leads, Close, Malkovich and Pfeiffer, makes the story not only possible, but plausible; they’re operating on the idea that everybody concerned is absolutely mad as only the fabulously wealthy can be. This is a devilishly seductive black comedy. Kathryn (Sarah Michelle Gellar) and Sebastian Valmont (Ryan Phillippe) are amoral step–siblings in modern day Manhattan. Both of them spend their time shagging around the Upper East Side, but Kathryn has a great reputation among the upper-class society they are both a part of, whereas Sebastian is a notorious sleaze. In an effort to satisfy their lust for each other, Kathryn bets Sebastian that he can’t bed the virginal Annette (Reese Witherspoon), the headmaster’s daughter at their posh school, who has sworn celibacy before marriage. If Sebastian fails to bed Annette, then Kathryn gets his vintage Jaguar. If he succeeds, he gets Kathryn for the night. Cue saucy shenanigans and a subplot regarding defrocking the innocent pawn Cecile as revenge for Kathryn’s being dumped by Cecille’s current boyfriend. As added vengeance, Kathryn also sleeps with Cecile’s ‘true love’ even as she tells Cecile that she is helping them to get together away from the vigilante eye of Cecile’s overbearing mother. With its over-the-top performances and preposterous climactic ‘tragedy’, this is the kind of movie purists dismiss as a mockery of both the original film ‘The Dangerous Liaisons’ and of the book. However, if you don’t focus on the roots that it has shamelessly mangled, this film is a lot of fun that will entertain you.